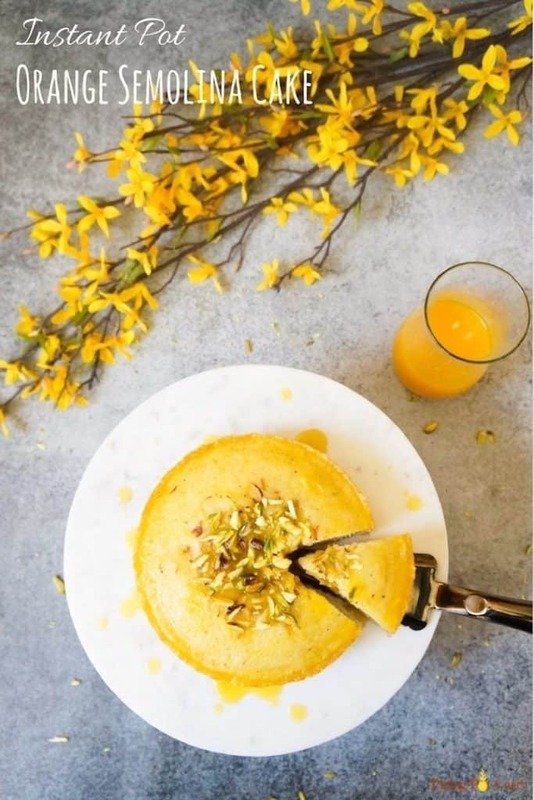 Orange Semolina Cake / Rava Cake topped with orange syrup made in Instant Pot or Pressure Cooker. 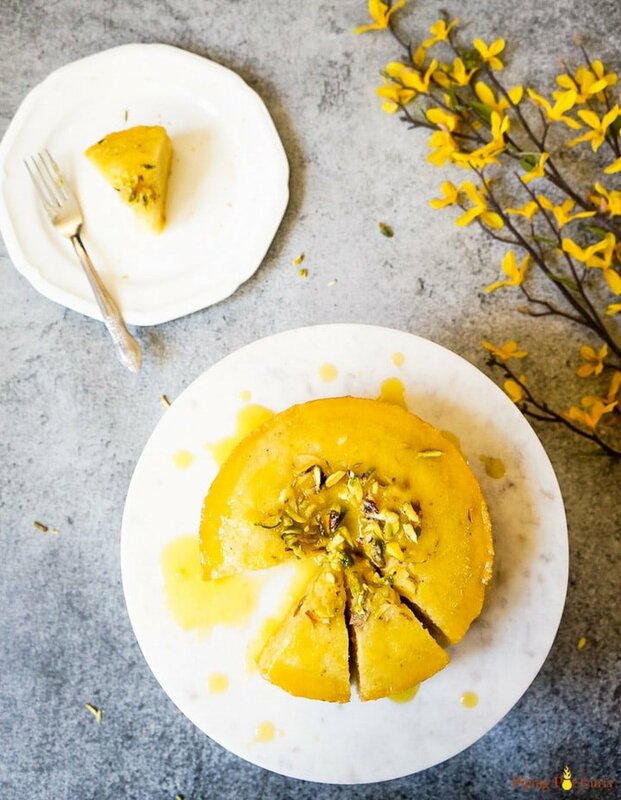 Let me introduce you to this semolina cake, so easy to make…so delicious. It is fluffy and moist with the gorgeous orange flavor. This is a egg free cake, perfect for vegetarians. The main ingredient in this cake is Semolina, which is used in many Indian dishes. This is typically made as a dry cake, which can then be soaked in sugar syrup, which I have in this recipe changed to orange sugar syrup. 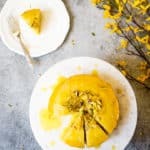 I had tried an orange polenta cake made by a colleague and since then I have been craving to make an orange cake myself. Finally I got to it and here is Orange Semolina Cake for you! As I was creating this recipe, I saw that semolina is popular in any other cuisines as well. In Greek, Turkish and Albanian cuisine, semolina cake is called Revani. In Egyptian cuisine, it is called Basbousa. They are typically drenched in sugar syrup. It is very interesting to see the similarities in cuisines around the world. The special thing about this recipe is that it is made in a Pressure Cooker. 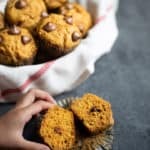 I was seeing people make such wonderful cakes in their Instant Pot, from cheesecake to banana cake and even chocolate cake. However I was not flattered by the banana cake made in the Instant Pot, it was too dense for our family’s taste. However I can assure you that this Semolina Cake will not disappoint you! I tried two versions of this semolina cake, one where I pressure cooked the cake, and another where I steamed it while venting the steam. I preferred the second one more as it was a bit more fluffier than the pressure cooked version. You might also like this Fudgy Brownies made from scratch in the instant pot. Check it out! 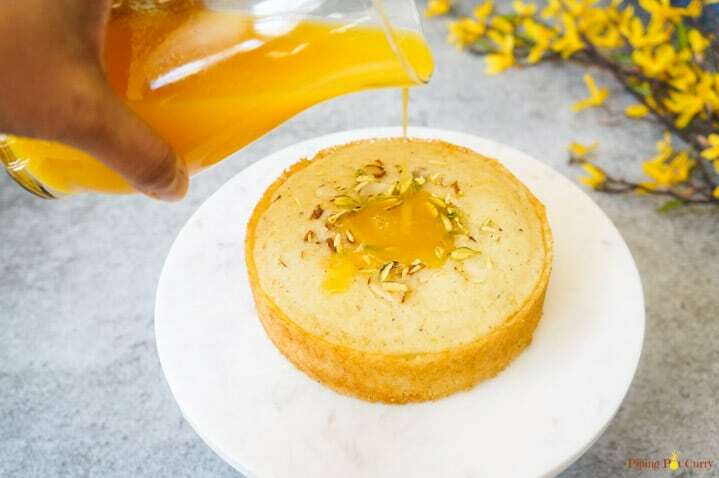 How to make Orange Semolina Cake in Pressure Cooker? Bear with me as I show you pictures of the process to make this cake. 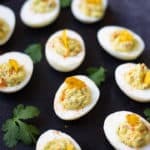 You can always click Jump to Recipe button on top of this post if you want to get to the recipe directly. Let’s gather the ingredients. I recommend using fine semolina for this recipe. I add very little butter, about 3 tablespoon when making this cake. You can use oil or ghee as a replacement for butter too. An optional ingredient in this recipe is cardamom powder. 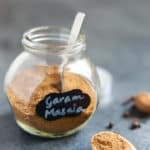 Indians love cardamom in our desserts, but feel free to skip it if you are not fond of it. Mix all of these ingredients to the semolina and let it sit for 15 minutes. This helps the semolina to soak in the butter and milk. After 15 minutes, we will add in the orange zest, baking powder and baking soda. Mix it in. After adding baking soda we want to get to cooking this right away. 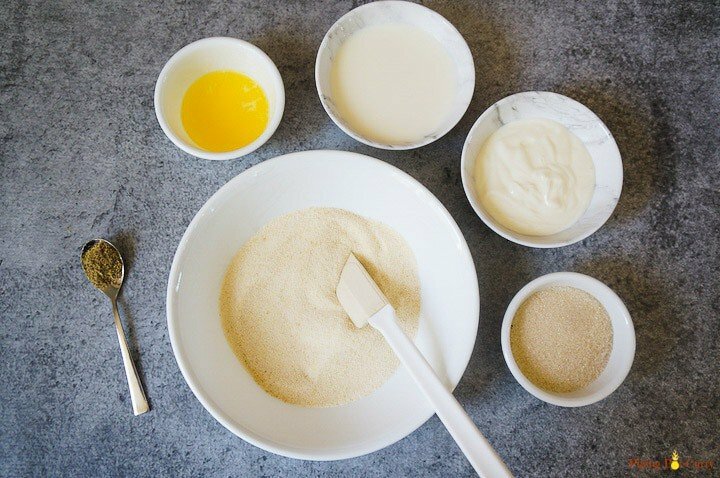 After mixing in the baking soda and powder, transfer the batter to a greased cake pan. I used the 6″ Fat Diddio pan with a removable bottom as that fits easily in the instant pot and also makes it super easy to take out the cake once it is cooked. Now we want to cover the cake pan with a paper towel and then a foil so the steam does not go into the cake. You can also prepare a aluminum foil sling to easily take the cake out once it is cooked. We will add about 2 cups water to the pressure cooker and let it come to a boil (Start this while the batter was resting for 15 minutes). Then place a trivet and the covered cake pan with the sling in to the instant pot. I cooked the cake on Steam setting of the Instant Pot for 22 minutes. My preference is to keep the instant pot in venting mode, so the steam will be releasing while the cake is cooking. Another important thing is that as we are doing venting mode, the instant pot timer does not work (it only starts after the pressure is built), so keep the separate timer. After the timer goes off, turn off the instant pot and open it. Let the cake sit in there for 5 more minutes, then remove and open it. Test that it is cooked by inserting a knife/skewer in the center and it should come out clean. My pressure cooking trial – I also tried making this cake on Steam mode with vent in sealing position for 20 minutes. Then released the pressure 10 minutes after the instant pot beeped. It worked fine, but the cake was more fluffier when made with venting position. So that is certainly my recommendation for this cake. If you like, you can always try this one too. While the cake was cooking in the instant pot, prepare the orange syrup on stovetop. The only 3 things needed for the syrup are 1 orange, sugar and water. Add both the zest and the juice of the orange (I also added some zest from this into the semolina), sugar and water to a pan and let it boil. Pour this syrup on top it on the cake. You can add this to the cake in the baking pan itself, as soon as you take the cake out of the instant pot. You can also top with nuts at this time. I used sliced pistachios and almonds. One tip is to reserve a few tablespoons of the syrup to top on the cake while serving. It makes the experience even more delicious. I loved the addition of orange to this cake. Low Sugar and Low Calorie – You can enjoy this cake without any sugar as a coffee cake. 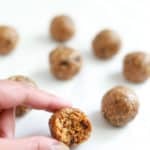 It tastes great even without the syrup and pairs well with a hot cup of coffee or tea. Plain Sugar Syrup – Try this if you don’t have oranges. You can add a cinnamon stick while making the syrup, which can be removed once the syrup is cooked. 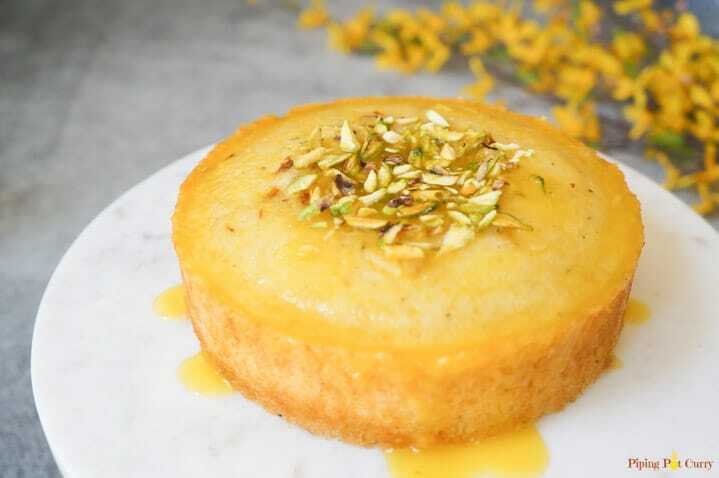 Semolina Cake / Rava Cake topped with orange syrup made in Instant Pot or Pressure Cooker. An easy to make, fluffy and moist cake with the gorgeous orange flavor. This is a egg free and flour free cake perfect for vegetarians. Grease a 6 inch cake pan with some melted butter (or another cake pan that fits in the pressure cooker). Prepare an aluminum foil sling by taking a 20" inch long foil sheet and fold it lengthwise to make a sling as shown in the picture above. In a large bowl, mix semolina, sugar and cardamom. To it, stir in yogurt and milk. Then mix in the melted butter. Let this batter rest for 15 minutes, so the semolina can absorb the liquid. After about 10 minutes, add 2 cups water to the pressure cooker insert. Place a trivet. Start the pressure cooker in sauté mode and let the water heat. 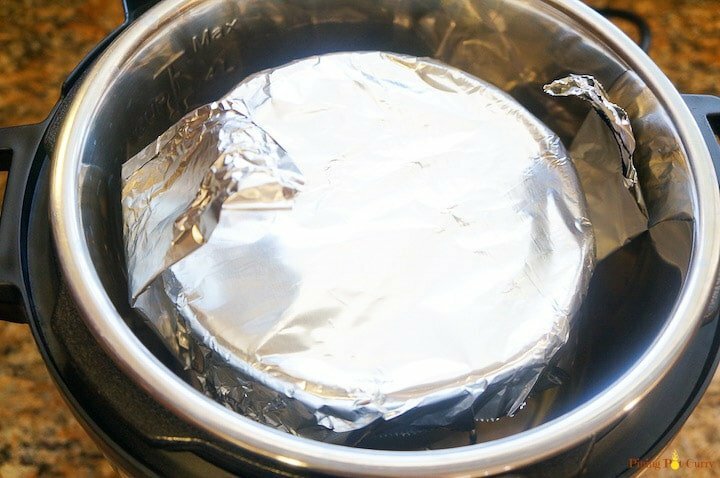 Cover the cake pan with paper towels and foil. This is important so the steam does not go into the cake batter while it is baking. Place the cake pan on the sling. Pick and place on the trivet in the pressure cooker. Press Cancel and close lid with pressure valve in venting position. Start pressure cooker in Steam mode for 22 minutes. The timer will not work as we are not pressure cooking, hence set an external timer. While the cake is cooking, prepare the orange syrup in a saucepan/pot on stovetop. Combine the zest, sugar, orange juice and water in the pot. Bring to a boil on high heat, stirring until sugar dissolves. Turn heat to low and let cook for 2-3 minutes. Turn off heat and keep this syrup ready to add to the cake. When the timer is done, open the pressure cooker and let it rest for 5 minutes. Then take the cake out and check that it is done (insert a clean knife or toothpick at the center of the cake, which should come out clean). .
Run a knife around the edges of the cake. Pour the syrup over the cake. Let it cool completely; syrup will get absorbed into the cake. Top with some sliced pistachios. After about 30 minutes to an hour, slice and enjoy the cake. No syrup variation: Adding the syrup is optional, the cake is delicious even without the syrup. Simple sugar syrup variation: You can prepare the syrup with only sugar and water too. Orange juice is optional. For extra flavor, add a cinnamon stick while making the syrup, which can be removed once the syrup has cooked. Tip: Save some syrup to top while serving the cake. I use a removable bottom 6 inch Fat Diddio cake pan to make this cake, as it is just easier to remove the cake from it. Pressure cooking trial - I also tried making this cake on Steam mode with vent in sealing position for 20 minutes. Then released the pressure 10 minutes after the instant pot beeped. It worked fine, but the cake was more fluffier when made with venting position. So that is certainly my recommendation for this cake. If you like, you can always try this one too. How long did you cook it when you tried it with the pressure cooker mode? I tried the steam mode and ruined it by having too much paper towel overhang that ruined the seal and let steam in, but aside from that I burned myself putting it into the pot; steam from the heated water scalded me. I don’t trust myself not to do that again so I want to just try the pressure version. Hello, cake looks lovely. Thanks for the recipe. How long do we need to bake if baked in oven and at what temperature. Thanks! Hey Pushpa – I would suggest preheat oven to 350F, and bake for about 45-55 mins. Hope you enjoy the cake! 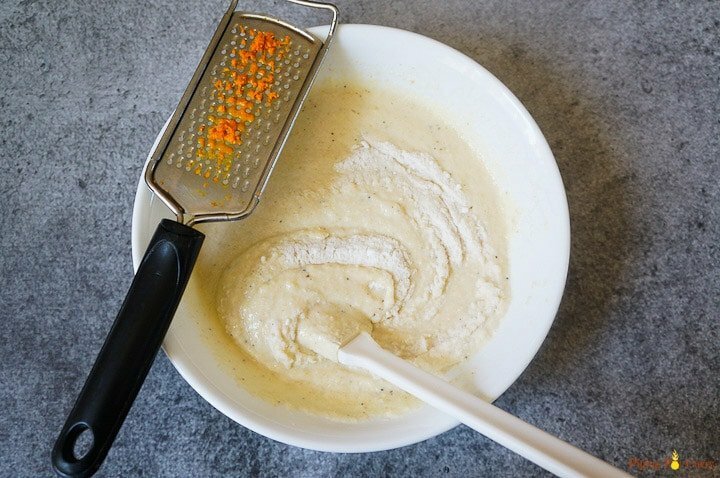 How much orange zest do you add to the cake batter? Hey Mary Ann – Just about a teaspoon. Hope you enjoy the cake. This cake looks amazing! I don’t have an instapot. 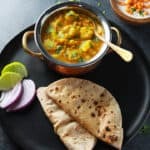 Can I try this in regular pressure cooker? 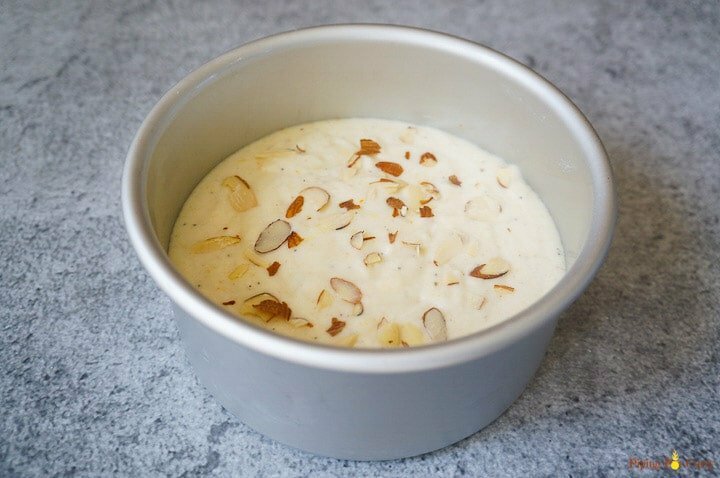 Hey Vruti – Yes, this cake should work in a regular pressure cooker too. Please check some recipes to find the timing for a stovetop pressure cooker. Gorgeous looking cake! I will try to make this soon for my daughter. Hope it will come out great.